To be a successful lawyer, be prepared to forge your own path — no matter how long or how hard it may be. 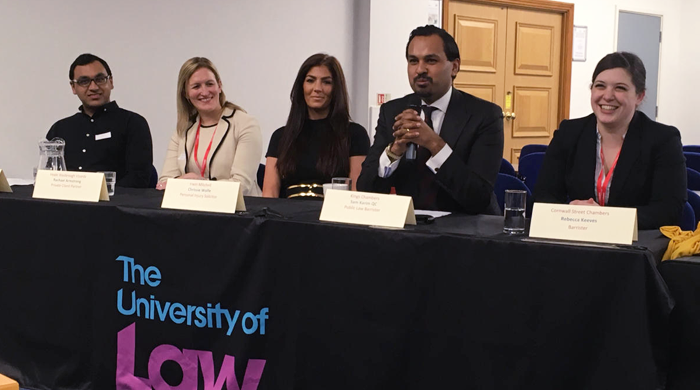 This was the resounding message offered by the panel at last week’s student careers and commercial awareness event, ‘Secrets to Success’, at The University of Law’s (ULaw) Birmingham campus. This was exemplified by Cornwall Street Chambers barrister, Rebecca Keeves, whose “unusual route to the bar” took over 12 years, including her undergraduate degree. Despite knowing she wanted to be a barrister since the age of 13, Keeves’ career journey experienced difficulties when, like so many others, she failed to obtain pupillage. After attending a school where teachers were overworked with class sizes and discipline issues, Keeves went on to study history and psychology at Coventry University. Unfortunately, having spent most of her second and third year of university in hospital, Keeves graduated with a 2:2. The problem? Not seeking support. “I refused to ask for help. Don’t do that. If you have a problem, ask for help. It is not a sign of weakness,” she explained. Undeterred, Keeves went on to complete a Graduate Diploma in Law (GDL), a Bar Vocational Course (now the Bar Professional Training Course) to then be awarded an LLB (Hons) at the University of Law (then the College of Law). Having not secured pupillage and being aware of the limitations from her first degree, Keeves pursued qualification through the Chartered Institute of Legal Executives (CILEx) — the third, and often overlooked, branch of the legal profession. During the day, Keeves worked as a CILEx graduate member and then fellow, managing her own caseload. Come the evening, Keeves completed an LLM in legal professional practice (commercial law) and the Legal Practice Course (LPC) with an MSc in law, business and finance, eventually achieving a distinction in both. Using her fellowship as an exemption from a training contract, Keeves qualified first as a solicitor with higher rights in criminal and civil law. However, Keeves stuck to her bar dream and, after obtaining a full pupillage exemption, began tenancy at Cornwall Street Barristers. “A lot of people on the bar course with me have said, ‘You’re mad! Why have you spent all this time doing this?’ I say, ‘Because I get the rest of my career to do something I love’,” she told the audience of 45 students. The panel also demonstrated that being a top lawyer doesn’t require an undergraduate degree from a Russell Group university. Like Keeves, panellist Sam Karim QC, a public law and arbitration barrister at Kings Chambers, completed his law degree at Birmingham City University. After fifteen years in practice, Karim applied for silk in 2017 — a “daunting but rewarding” process where his ability to handle complex, high-profile cases, including those he took while representing the government as a member of the Treasury Counsel panel, was assessed. With such a successful career to date, it may come as a surprise that law wasn’t his first choice of career — it was only after Karim failed to get into medicine that he decided to pursue a career at the bar. “It has turned out pretty well overall,” the Birmingham-based barrister reflected. Similarly, Irwin Mitchell solicitor, Chrissie Wolfe, revealed she had other plans before the law. She studied biological science at the University of Birmingham in the hope of becoming a vet. Initially reluctant about a career in law, for fear it was “all paperwork and corporate offices”, Wolfe found herself drawn to personal injury law — a huge part of Irwin Mitchell’s overall practice. This area, which often requires an understanding of medical and scientific knowledge, was the perfect opportunity to apply the skills she picked up from her STEM degree. Now practising in Irwin Mitchell’s international personal injury team in Birmingham, Wolfe also runs a popular law and lifestyle YouTube channel, Law and Broader, which enables her to help others pursuing a career in law. When the pressures of having a full-time job left Wolfe little time to offer mentorship in person, offering advice through vlogs was a convenient alternative. “I see vlogging almost like online mentoring because I get to speak to all of my subscribers which I like to think of as my mentees,” she explained. For aspiring lawyers without a training contract or pupillage lined up, there are other ways to get into legal practice. One alternative route is to become a qualified secretary. This path was recommended by VWV partner, Rachael Armstrong, who during her year out completed a secretarial course before going to study law at De Montfort University in Leicester. After finishing the LPC, Armstrong secured a job as a legal secretary and within four months was offered a training contract. “You get your foot in the door however you can and you prove yourself — you do a better than great job,” stressed Armstrong, who is now based in VWV’s private client practice. Going the extra mile means using your initiative and seeking out work rather than waiting for it to be handed to you, she added. There’s also the paralegal route to practice. This is a good opportunity for a firm to get to know you and vice versa, said Asim Khan, in-house legal counsel for global financial technology business IRESS. Prior to moving in-house, Khan secured a paralegal role, before going on to complete his training contract and qualifying as solicitor in private practice. Aspiring lawyers should, however, be cautious of falling into the paralegal trap, warned Khan, who studied law at Lancaster University. This is where a firm recruits you as a paralegal and, because you perform so well, they rather keep you in that position than see you move out of the paralegal role, he explained. If you’re struggling to find a legal job, opportunities can be found elsewhere, Khan advised. While studying the LPC, Khan worked full-time in a National Grid call centre, handling gas emergencies. Through this Khan was able to secure a month’s work experience in the National Grid’s legal department. “See what opportunities there are within the company you’re working, and where you might be able to get some work experience,” he advised.